MARY JO CUSACK AND THE FRAMED PLAT OF RIVERLEA SHE RECEIVED AS A THANK YOU FROM THE RIVERLEA VILLAGE COUNCIL MEMBERS. WHEREAS, in these and other efforts, Mary Jo Cusack has provided considered, thoughtful and measured leadership, counsel and commentary to the Council, to other Village officials, and to the citizenry, all with a remarkable spirit of collegiality, and has thereby exemplified the ideal of public service. Section 1. 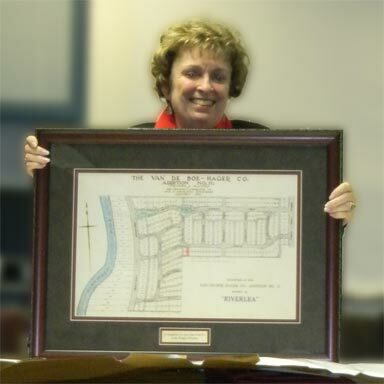 On behalf of the citizens of the Village of Riverlea, Ohio, the Village Council hereby offers its gratitude, appreciation and thanks to Mary Jo Cusack for her years of service on the Village Council and as Mayor of the Village of Riverlea and for her dedication and efforts on behalf of the residents of the community. Section 2. This Resolution shall be in full force and effect from and after the earliest date permitted by law. Pursuant to Section 731.25, Ohio Revised Code, the Council of the Village of Riverlea hereby determines that publication of this Resolution in a newspaper is unnecessary and does hereby determine that this Resolution shall be published by posting copies hereof in the five places which are determined to be the five most public places in the Village of Riverlea, Ohio. AND being seconded by Messrs. Ankrom, Gordon, Griffin, Hamor, and MacGilvray, and the requirement to read the same on three separate days having been waived, said Resolution was duly ADOPTED this 19th day of December, 2011. I hereby certify that on the 21st_ day of December 2011, I posted a copy of the above Ordinance in each of the five places heretofore designated by Council as the most public places in the Village of Riverlea and that the same remained there posted continuously for fifteen (15) days.